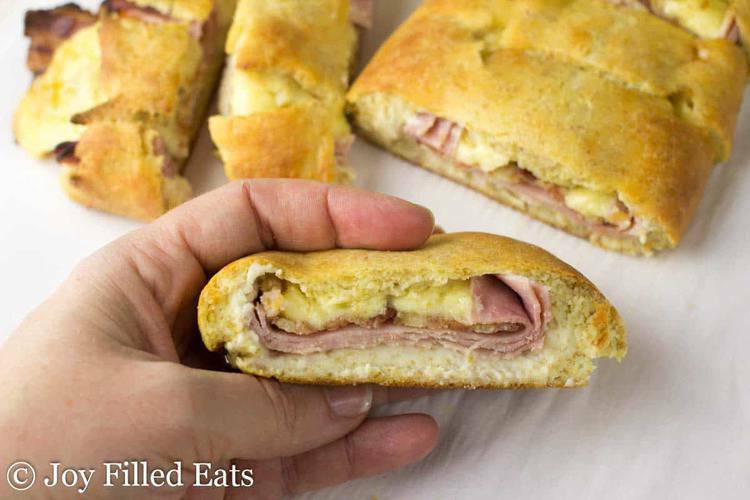 Golden dough stuffed with ham, Irish cheddar, and bacon. “Best dinner ever,” said the kids. And I agreed. This Loaded Stromboli was gobbled up before I had my fill. You better believe it’s going back into the dinner rotation. I really like eating with my hands. Don’t get me wrong, I use silverware when necessary, but hand held food is some of the best food. Pizza. Cookies. Chicken Kati Rolls (best Indian food ever). Tacos. Empanadas. Brownies. And stromboli. A couple years ago I made a ton of stromboli in all different flavors for a party. It worked really well. 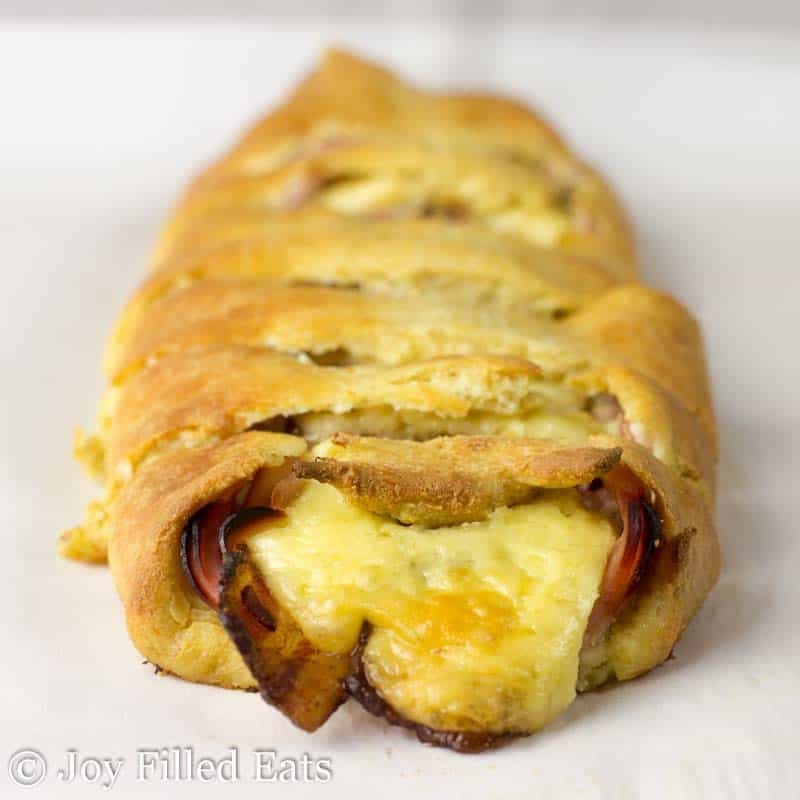 So, when I had some mozzarella cheese to use a couple weeks ago I decided it was time to add a stromboli recipe to my blog. Mozzarella dough can do just about anything. It is one of my fallback doughs for everything from pastries to pizza and savories. I use it in my Cinnamon Rolls, Caramel Pecan Sticky Buns, French Onion Tartlets, White Spinach Pizza, Raspberry Cream Cheese Danish, and more. This stromboli is like the best club sandwich ever. I love the combination of ham, bacon, and cheeses. 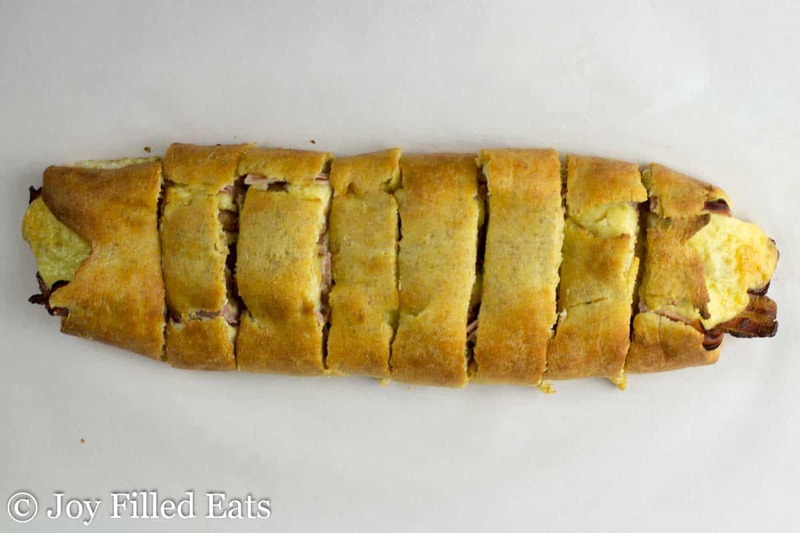 If you are looking for a more traditional stromboli check out this one from My Montana Kitchen. *** It is important to use a firm cheddar in this. Regular cheddar may just ooze out. Put mozzarella cheese and cream cheese in a microwave-safe bowl. Microwave one minute. Stir. Microwave 30 seconds. Stir. At this point, all the cheese should be melted. Microwave 3o more seconds until uniform and gloopy (it should look like cheese fondue at this point). Mix in the egg, flours, baking powder, and flax. You will need to dump it onto wax paper and knead it by hand to thoroughly incorporate the ingredients or you can do this in a food processor with the dough blade. 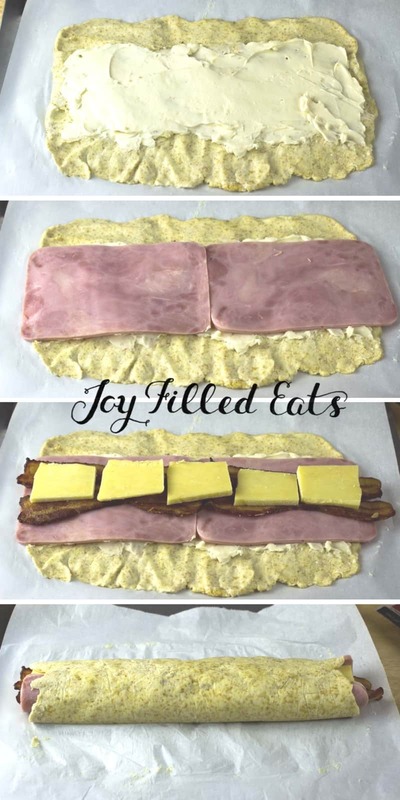 Press or roll into a large rectangle on a parchment lined baking sheet using wet hands. Spread with the swiss cheese wedges. Lay the ham on top and top with the bacon and cheddar. Roll into a log. Bake for 35-45 min until golden brown. 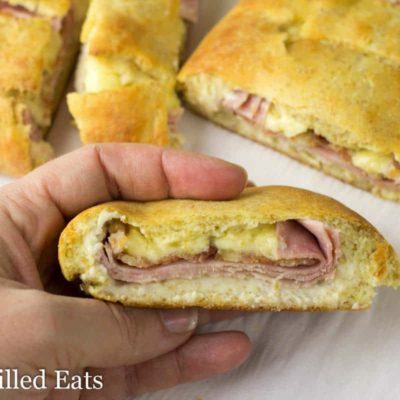 Golden dough stuffed with ham, Irish cheddar, and bacon. "Best dinner ever," said the kids. And I agreed. This Loaded Stromboli was gobbled up before I had my fill. You better believe it's going back into the dinner rotation. Put mozzarella cheese and cream cheese in a microwave-safe bowl. Microwave one minute. Stir. Microwave 30 seconds. Stir. At this point, all the cheese should be melted. Microwave 30 more seconds until uniform and gloopy (it should look like cheese fondue at this point). Mix in the egg, flours, baking powder, and flax. You will need to dump it onto wax paper and knead it by hand to thoroughly incorporate the ingredients or you can do this in a food processor with the dough blade. Nut allergy at my house. Could this be made with all coconut flour? 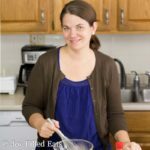 You can use a nut free dough such as: http://www.sugarfreemom.com/recipes/grain-free-nut-free-low-carb-pizza/ and then proceed with the rest of my recipe. Do we add the baking powder with the flours? how much is net carbs per serving? There is a nutrition box at the bottom of the post. Net carbs are 3 carbs per serving. So how would one make this recipe without a microwave? You can melt the cheese on the stove top over low heat. What other cheddar cheese can I use besides Irish cheddar. I can't find that. Any firm cheddar will work. Nope, but that sounds like a great idea! Do you have the nutrition facts for your Loaded Stromboli recipe that can listed here? This looks wonderful and I'd love to try it but being a pre diabetic I must watch my daily intake of carbs. Mine turned out tasty but dry. I believe it's due to the fact that i used a measuring cup for grated cheese instead weighing. I will keep making it. It tastes great. Thank you.